Utah had the pleasure this April of hosting women’s cycling advocate Sarai Snyder, founder of the website Girl Bike Love (girlbikelove.com) and the worldwide CycloFemme ride (cyclofemme.com). 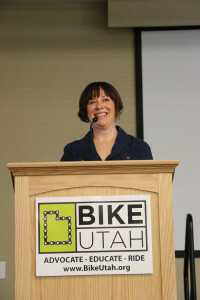 As one of the speakers at the 2014 Utah Bike Summit on April 25, she treated the audience with a presentation titled “The Power of the Pedal.” Snyder’s message focused on the empowering force behind the perfect machine, a benefit of cycling often lost among the green initiatives and asphalt advocates. Over the past few years, Snyder has become a strong voice in the bicycle community, especially on behalf of women, who often go underrepresented in the various branches of cycling, including product development and marketing. The impetus to create Girl Bike Love in 2010 came from a place of observation working for a bike shop in Boulder, Colorado. “I ran a bike shop for about four years and I just kind of recognized that, not only did I want to share my knowledge with women all over the place, but also, I really wanted to help bike shops. I really wanted to be a resource to help them make that connection with female cyclists,” says Snyder. Girl Bike Love, “the hub and soul of women’s cycling,” is a beautiful resource for female cyclists of all types—from casual urban commuters to Lycra-clad roadies. Why is a gender-specific website like this needed for cycling? Well, first and foremost, it sheds all of the intimidation that permeates the male-dominated activity. Segments like “Tool Tuesday” feature a weekly post that describes a bike tool and breaks down what it is and what it can be used for, without making you feel stupid, or creepily reaching around to “fix that for you.” There are “Girl Gear” reviews, “How To” tutorials for finding the right bicycle, and perhaps most importantly, stories about cycling written by women. “I feel like in advocacy a lot of times, we get so busy thinking about safety and infrastructure and funding and working with the government to get the resources that we need, but sometimes we forget that getting more people involved is one of the main things that’s going to help us in getting those things that we need, and the way we get more people involved is in telling better stories,” says Snyder. The stories range from a day-by-day recap of seven women riding the RaphaTOC, to an article on how a Rwandan woman’s future turns dramatically when she’s given a bike. It’s an inspiring amalgamation of how the bicycle generates positive change in the lives of women across the globe. Utah currently has three rides registered in Magna, Provo and Salt Lake City, details for which can be found in the calendar section of this issue and at cyclofemme.com. All cyclists are welcome to join. Join the conversation at girlbikelove.com.